I've deleted this unnecessary post which has nothing to do with the thread subject matter. 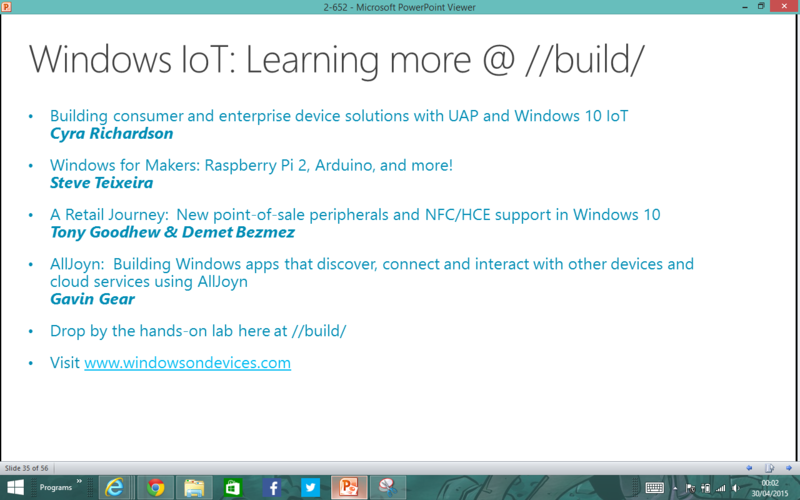 The session on Internet of Things which these slides are from starts in about 30 minutes, right now (about 00:30 UK time) the live stream just finished showing a .NET 2015 session (Jay Schmelzer did briefly mention Rapsberry Pi and Xbox One as platforms where .net apps could run) There's also this session which starts at 03:30 UK time "Windows for Makers: Raspberry Pi 2, Arduino and More" http://channel9.msdn.com/Events/Build/2 ... tedsession. 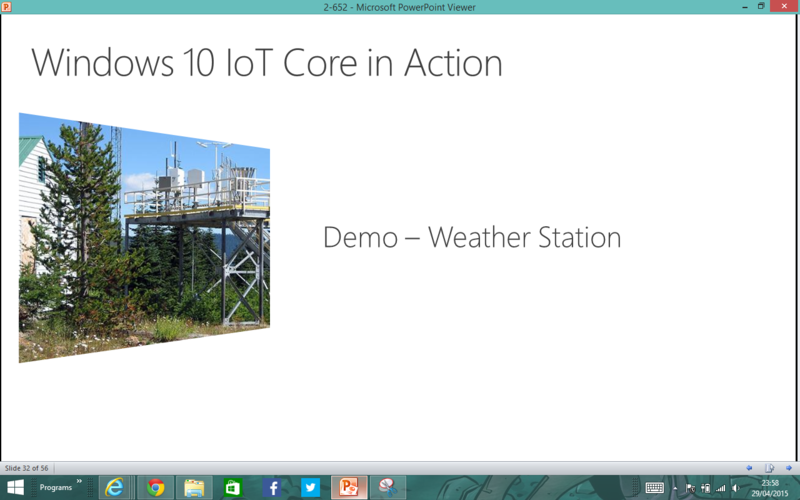 Hopefully they would make "Windows 10 IoT Core" preview download available shortly after that session ends... I need to go to bed now but I'll check this again when I get to work tomorrow! 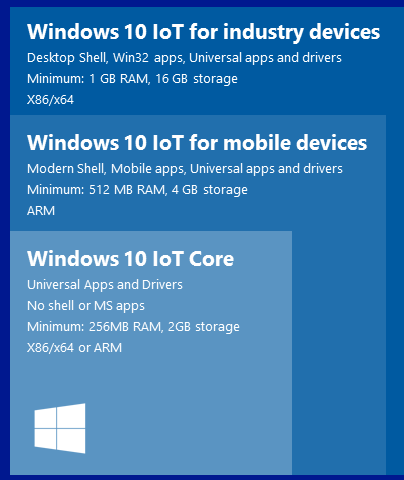 I assume this means that a Raspberry Pi running Win10 IoT Core would be a very stripped down version of Windows which only has one Universal App deployed to it? 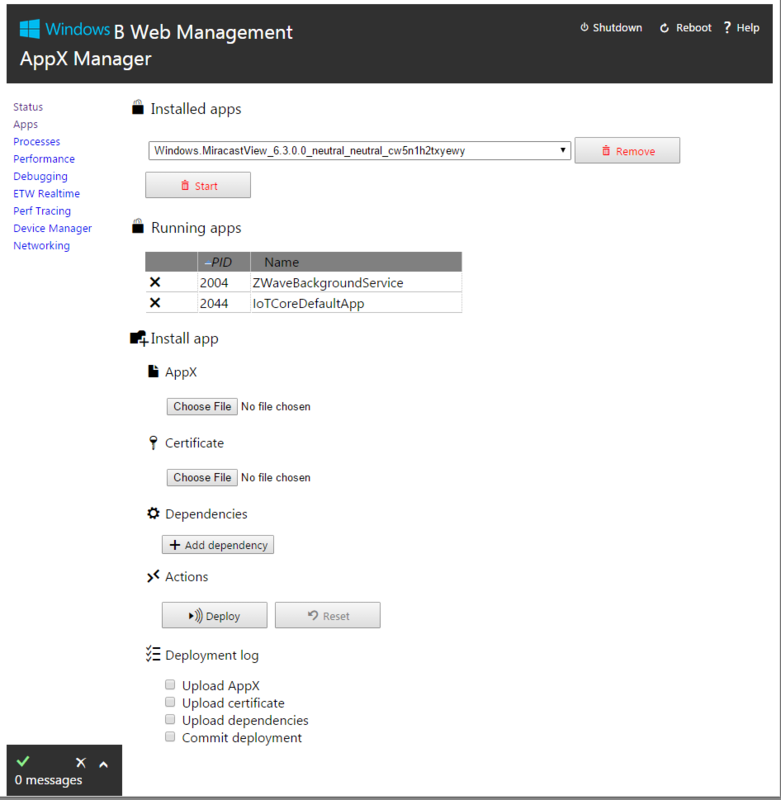 "No shell or MS apps" is interesting - maybe this just means there will be no start screen, control panel etc (of course no desktop) but there would still be a graphical interface of some sort? By which I mean, keyboard, mouse, accelerated graphics, enough to be able to use a graphical Universal App. About licensing... I suspect it would not be allowed for someone to build and redistribute an SD card image of the preview or release versions of Win10 IoT Core for free on the internet. Obviously companies who are building products using a Raspberry Pi would license Win10 from Microsoft. 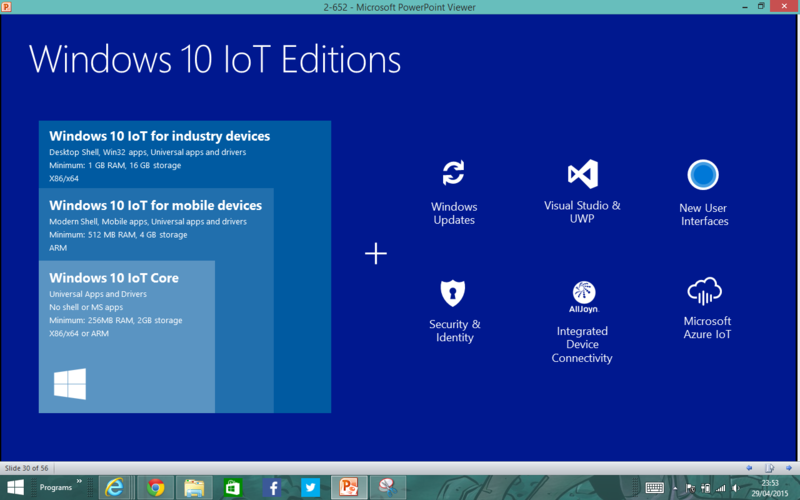 For people who just want to play with it at home "for evaluation purposes" and so on, I'm sure there will continue to be free evaluation versions of Visual Studio with everything needed to build their own Win10 IoT Core image for the Raspberry Pi - the same like VS2008 and Windows Embedded Compact 7 are available. I'll post more when I know more - what do you think? 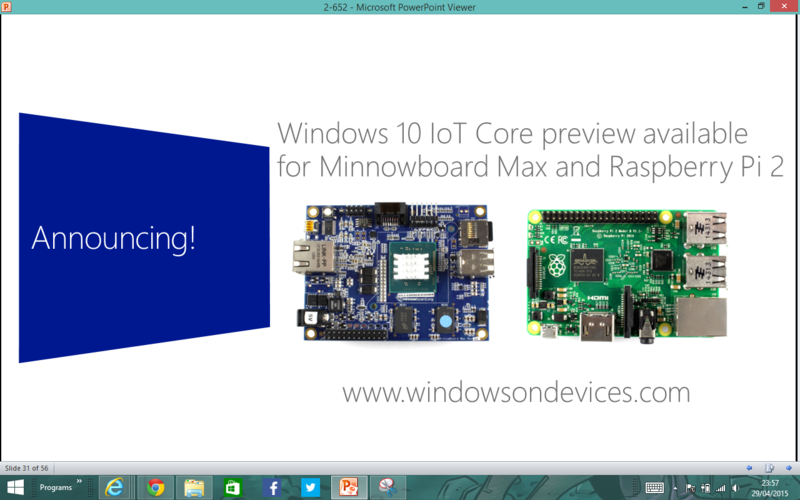 Has any managed to flash the Windows 10 IoT core image for RPi 2? I don't have my RPi2 yet, but I got the image from Microsoft Connect. So one needs a PC with Windows 10 Preview installed, so basically despite the hype the RPi is as many have said, me included, is being used as a test bed for Windows 10 ARM Apps. Yep cross-platform development. Can you guys actually download the Pi2 Win10 Zip file? I saw a link to it, but the page to which I got referred didn't actually have the file. Also is it really necessary to install W10 on my desktop in order to install it on the Pi? For me that's a no-go. OttovanZanten wrote: Can you guys actually download the Pi2 Win10 Zip file? Yes you need Windows 10 preview installed natively on a x86 Laptop / PC so it can communicate with the Raspberry Pi as the Raspberry Pi is controlled by the Windows machine. It's been so long since I've done any DOS programming that I forgot about that. That is a contradiction in terms is it not? For folks who signed up for the program and haven't received an email update, we apologize. We are working to fix our email system and you will be receiving an update from us shortly (highlighting the release of Windows 10 IoT Core for Raspberry Pi 2). We've been trying to limit our email communication until we have new information (good feedback that we've probably been too quiet). Now we have our first release out we will be regularly updating the bits (approximately monthly) expect to see more communication from us. So you agree. Not cross-platform at all. Last edited by NizZ8 on Thu Apr 30, 2015 8:32 pm, edited 4 times in total. pranishk wrote: For folks who signed up for the program and haven't received an email update, we apologize. We are working to fix our email system and you will be receiving an update from us shortly (highlighting the release of Windows 10 IoT Core for Raspberry Pi 2). We've been trying to limit our email communication until we have new information (good feedback that we've probably been too quiet). The only email that I've ever received is the acknowledgement of the sign-up.